Like many Italians, I too often have a craving for cheese. But unlike the cheese obsessed inventor Wallace, fortunately I have enough willpower and common sense to keep my cravings both under control and here on the planet Earth. Yet, luckily for Wallace, creator Nick Park gave the dreaming Englishman an ideal companion in the form of his loyal, protective, proactive and much more street-wise canine sidekick Gromit. However, as we learn in the debut Oscar nominated short A Grand Day Out (one of two Oscar nominations garnered by Park that same year along with another for Creature Comforts) Gromit is able to transfer the smarts acquired on the streets of London to the moon. This occurs when Wallace builds a rocket ship and decides the two should travel there for a picnic and a chance to see just how the moon-- which some indeed believe is cheese-- actually tastes. In comparison to the three additional Wallace & Gromit short works that Park and (eventually) his animation team would create over the next twenty years, 1989's A Grand Day Out takes slightly longer to grab the audience's attention. Nonetheless, the creativity of the work and the way it foreshadowed some of the characteristics and developments to come in the two successive Oscar winning shorts is unmistakable. In both my first encounter with the characters as well as the short that remains my favorite more than a decade later-- The Wrong Trousers-- Nick Park collaborated alongside a team of animators in his most ambitious work yet which he noted in a behind-the-scenes Blu-ray extra was constructed with each animator working with a different stop motion set and on average achieving four seconds of actual footage on each day. Always recording the dialogue first and then-- like most animators-- acting it out later to figure out what a character would look like saying it, Wallace was perfectly brought to life with the distinct voice of Peter Sallis whose lively reads of scenes made the whimsical, good-hearted but admittedly interpersonally challenged Wallace feel incredibly human. As playful as the the inventions utilized in Jacques Tati's Mon Oncle, Wallace works extremely hard to make life convenient by creating devices he hopes will save time that inevitably malfunction or take on a life of their own. Picking up in the same good-natured spirit of the work completed four years after Grand in 1993, we catch up with the two main characters who are still living an ultra-modern lifestyle with Gromit involving endless machinery to make their breakfast and deposit Wallace from his bed through a trap door and right to a seat at the breakfast table. Forever taking Gromit for granted, Wallace gives our favorite brainy animated dog a bizarre self-walking collar and leash toy that will enable Gromit to take himself out on his own by inventing a bizarre pair of walking “Techno Trousers” to do just that. While Gromit is obviously unamused, he seeks comfort in his favorite way by knitting like mad but a further figurative wrench is thrown into the mix when Park gives Trousers a classic Film Noir twist. Pushing the plot forward with a deceptively adorable new character, Park adds in a new tenant in the form of a mysterious penguin who threatens the close dynamic between our British duo. Starting off on the wrong foot by commandeering Gromit's room and taking over the place as the "alpha pet," although Wallace is as blind as ever to the dark side of strangers, Gromit is quick to sniff out trouble which occurs after the penguin begins reading "Electronics for Dogs" and uses the Techno Trousers for a criminal purpose. Trousers incorporates Park's first sketches of a model railroad chase and the two year effort is a thrilling achievement of the painstaking clay figurine stop motion process that calls to mind in spirit some classic Disney shorts (including Pluto's Christmas Tree). Likewise, we realize that we're as emotionally attached to the characters as Park is as we witness throughout the films and featurettes contained on the packed disc. Fast paced and filled with intricate sequences, The Wrong Trousers and the subsequent Oscar winner experienced via 1995's A Close Shave are still stunning to this day. And while Shave is especially important for helping to launch the Shaun the Sheep series, in my mind it's The Wrong Trousers that's still one of the most innovative animated shorts I've seen in decades and on par with the consistent geniuses at Pixar who first endeared us with the short about the desk lamp that would become their logo. 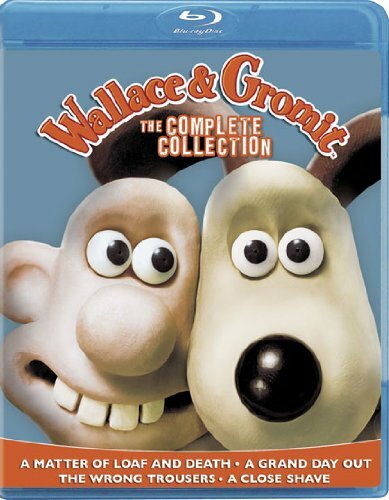 While personally, I always wondered what would've happened if more of these clever animators would get together to experiment in a wide variety of formats from pencil drawings to computer animation, puppetry, claymation, and 3D, it's a wonder to behold the unique vision of Park's Wallace & Gromit series in this wonderful Blu-ray collection from Lionsgate and HIT Entertainment. And although W & G enthusiasts may already own the aforementioned titles as well as their Oscar winning big screen adventure The Curse of the Were-Rabbit, the first Blu-ray treatment of the films offers you an additional reason to upgrade via the presentation of the newest half hour short film featuring the two since 1995's Shave. Titled A Matter of Loaf and Death and also available separately in a single disc form from the same companies, I was excited to discover that the tone remains as sweet and refreshingly inventive as ever. And similar to the various career schemes embarked on in the others, this time around we're quick to learn that Wallace has gotten the two into yet another money making venture working at a bakery aided by his technological creations of course, for better or worse. While Wallace always had unfortunate luck in the romance department, Loaf finds both he and Gromit getting hit with love's thunderbolt as Park's plot-line hearkens back to the Film Noir inspired subplot of Trousers by introducing the possibility that Wallace's new fiance could be either a femme fatale or some sort of black (or rather baker!) widow. Winner of the 2008 British Academy Award for this most recent installment, the irresistible blend of darkly comedic setups and a penchant for dog and (random) character elaborate chases makes it a wonderful fit to the W & G series and one that I hope doesn't mark the end for Park's beloved characters. Highly recommended with excellent sharpness in the Blu-ray transfer to make the effect of the elaborate animated process stand out even more, the collection which is also available as a four disc DVD set is packed with extra features including commentaries on all four shorts, behind-the-scenes mini-documentaries, Shaun the Sheep bonuses and more.